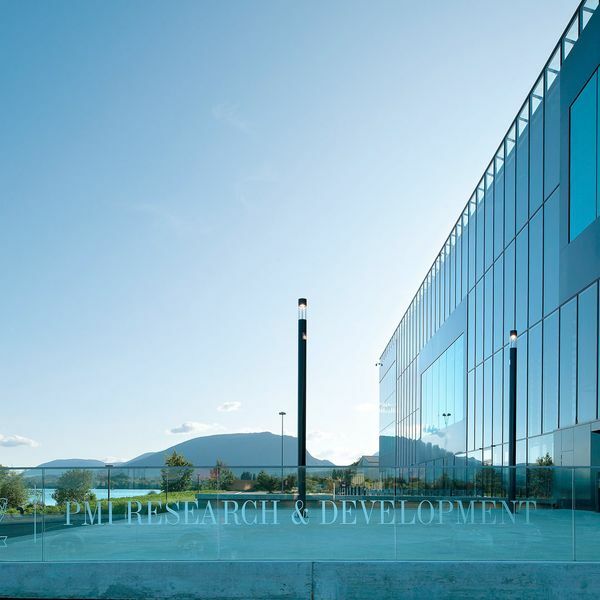 The remarkable background which the new Philip Morris International R&D campus is set in, a first line shore position, acts as an unquestionable support to the quality of the project. 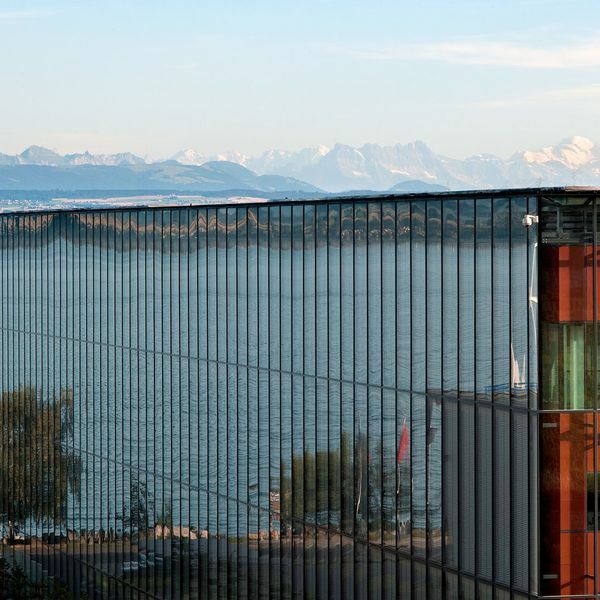 The PMI R&D new Campus marks the entrance to the Neuchatel municipality offering a high quality urban landmark. A simple, neat and elegant geometry is distinguished as a symbol of corporate image. Special attention has been given to the view of the building from the residential neighborhood located on the nearby hill. Following a respectful attitude towards environment, the roof is a mixture of surfaces in order to fragment the extension of the roof into an alternate system of glass and green. 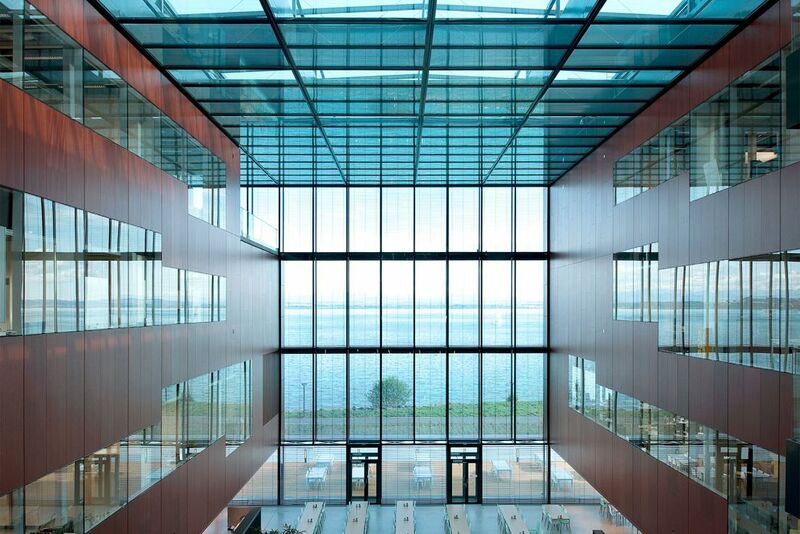 The perception of the 5th façade has been conceived through a morphing exercise between glass (water) and green. A new approach to the traditional wing system has generated the project. Through the following primary operations the basic wing system has been transformed into a landscaped environment: The fact of fragmentizing and extracting some volumes from the basic parallelepiped frame, gives as a result a specific geometry which hosts large variety of spaces. By this simple operation «life» is introduced into the building. 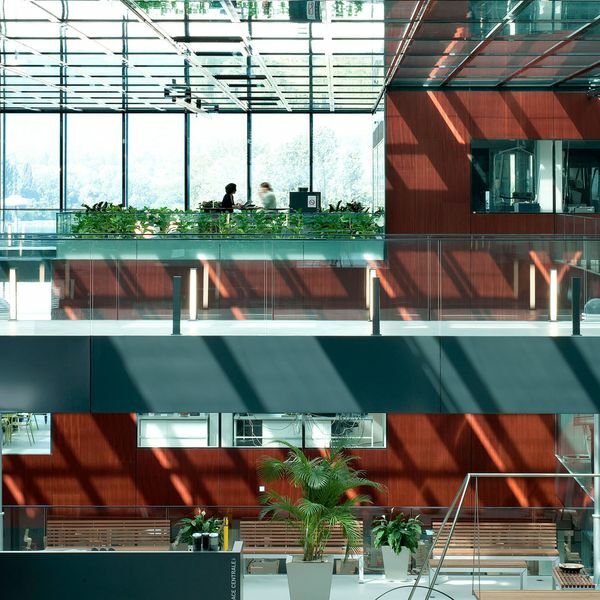 Terraces, gardens, bridges, platforms, relax areas, meeting room bridges, social meeting points, create a labyrinth of communication in which circulating throughout the building becomes an «experience». Due to a glass cover over the whole system, all spaces are protected and livable/usable all year round. In this sheltered enclosure users can seat «out» on the terraces, use the «open air» meeting rooms, enjoy a coffee break in a dense «outdoor» garden, work and socialize in the semi-outdoors spaces. The Entrance Gallery gives a strong corporate image due to its dimensions and position. It also hosts most of the public facilities such as Reception, Bar, Restaurant, Shop and direct access to the Event Hall, Meeting Rooms and Cloakroom. The three Wings gather the laboratories, offices and delivery area. Between the wings, great Atriums offer spaces with spectacular views on the lake from the different bridge levels which cross them. The Ground Floor of the atriums are imagined as Tobacco Gardens. Designed as specialized Botanical Gardens, they offer visitors a didactical tour through the different species of Tobacco plants. The Bridges crossing between the wings, are not only used as circulation means but also as communicating spaces. Spread throughout the working areas, a range of terraces and gardens allow having breaks and meetings in a protected environment while enjoying the breathtaking views.